MONTREAL - First the streets — now the courtrooms. After demonstrating night after night to protest a controversial law aimed at limiting protests against tuition hikes, students and myriad other groups are carving out another battleground. Lawyers for student federations and other groups filed two legal motions on Friday against Bill 78, the law adopted May 18 to crack down on the protests. The first motion seeks to temporarily suspend sections of the law that involve public protest. It will be heard next week in Superior Court. The second motion is to have Bill 78 declared invalid altogether, although it may take longer to reach a judge. Bill 78 has been used sparingly by police across the province, but the groups mounting the legal challenge say it severely restricts the fundamental rights of citizens. They call the motions ambitious but necessary. The government argues the law preserves the rights of students to attend school. It lays out strict regulations governing demonstrations, ordering assemblies of more than 50 people to give eight hours' notice for details such as the protest route, the duration and the time at which the demonstration is being held. Individual organizers and student groups could face huge fines if they don't comply. The penalties range between $1,000 and 5,000 per individual; $7,000 and $35,000 for a student leader; and between $25,000 and $125,000 for unions or student federations. One student association said Friday that just one fine would be enough to empty its bank account. The legislation also provides for fines for anyone who prevents someone from entering an educational institution. The student groups, labour federations and a wide range of other organizations claim the law is unconstitutional and a violation of basic rights. "We are doing this because we are genuinely worried that basic important rights such as freedom of association, freedom of expression and the right to hold peaceful demonstrations are being attacked," student leader Leo Bureau-Blouin told a news conference outside the Montreal courthouse. He said students are being prudent about their chances. Besides the student and labour groups, others supporting the legal action include feminists, ecologists, artists and community groups. "We're happy we're not alone in this," said Martine Desjardins, a student leader who represents university students. "A lot of citizens in Quebec — not just students — are fighting for their rights to be preserved." Another student leader described the motions as the biggest constitutional challenge in the history of Quebec. Those bringing the motion forward say they represent one out of four Quebecers. "It's a unanimous answer (from) the civil society of Quebec against this unjust law that is for us is clearly breaking the fundamental rights and freedoms of our country," said Gabriel Nadeau-Dubois. Replying on behalf of the government, Transport Minister Pierre Moreau appeared unimpressed with the large number of groups rallying around the cause. "I've pleaded (as a lawyer) long enough to know that what is important is not the number of applicants, it is the quality of arguments," Moreau said Friday. "The government took the time to prepare the law quickly. We have jurists and constitutional experts who think the law will stand." While the government indicated it would comply with the opinion of the court, Moreau said it's ironic that student leaders are going to court after chastising their own members who sought injunctions to return to class. "They're going to court to declare the law unconstitutional, but when the courts recognize constitutional rights or the right to study, they do not recognize the judgment," Moreau said. Veronique Hivon of the Opposition Parti Quebecois said she isn't surprised by the legal motions. "It was written in the sky that that law would be challenged," she said. "I won't speculate about their chances of success, but within 24 hours, the Quebec Bar talked about the law being unacceptable and 45 law professors signed a letter to that effect. So certainly, the violations of law are very serious." The first of the two motions is expected to be heard next Wednesday and is aimed at obtaining a temporary suspension of the law. The objective of the second procedure is to have the entire law struck down. If the case can make its way through Quebec courts quickly, it could wind up before the Supreme Court of Canada in short order, Bureau-Blouin said. "We hope that we will obtain something but, as you know, the judge will be the one to decide," said lawyer Giuseppe Sciortino, one of nearly 500 lawyers who have volunteered their time to put the case together. 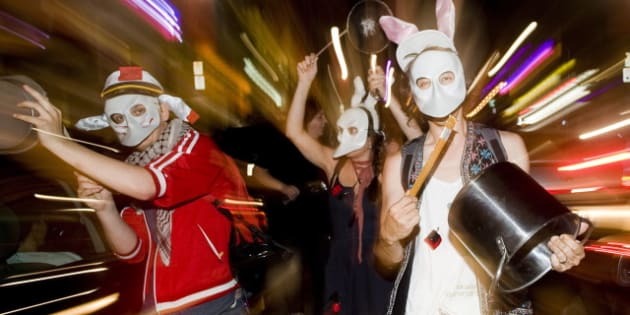 On Friday night, the regular nightly demonstration in Montreal began amid a cacophony of clattering pans in the park where it always gets going. There were similar get-togethers in other neighbourhoods, with the increasingly popular pots-and-pans protest being shouted down in one area by an angry passerby. Police once again declared the main demonstration illegal under a municipal bylaw because a route hadn't been provided. But bad weather proved to be more of a deterrent than police as flashes of lightning brightened the sky as people banged their metal pots. The sky opened up shortly after the march moved out, drenching participants and sending many scattering for a nearby subway station. Even though the rain was pounding at some points, a strong contingent of protesters marched on, almost seeming to revel in the downpour. They carted umbrellas and covered themselves in flags. Some even doffed their clothes and got stern warnings from police although there were no arrests. "Riot police seems to be having a good time tonight," tweeted Laurent Bastien. "Saw them sharing a laugh in their van." Other marches were held in other Quebec cities, including Sherbrooke and the provincial capital. There were also reports a demonstration was held in support of the students in downtown Toronto. A picture posted on Twitter showed a crowd milling around Dundas and Yonge streets holding picket signs aloft. Students in Ottawa had a small protest on Thursday. Bill 78 was introduced as a response to mounting student protests after the Charest government's insistence it would not back down on a previous announcement it would hike tuition fees by $325 a year over five years, beginning this coming September. That would have eventually boosted the figure to nearly $3,793 a year in 2017. While the proposed hikes would still leave Quebec with some of the lowest rates in the country, the issue has flared into a clash of ideologies. The students have called for a tuition freeze but the government has flatly rejected any idea of that. Negotiations are expected to resume next week. Meanwhile, protests of varying shapes, sizes and themes have been going on for three months and have picked up steam over the past month with nightly marches in Montreal featuring several thousand people. Of the few thousand arrests, only a minority have been for criminal infractions. The vast majority have been for municipal bylaw and highway code violations. As for Bill 78 violations, the only reports of arrests have been in Sherbrooke and Quebec City. Lately, regular citizens have been showing their own defiance to the bill by clanging pots every night at 8 p.m. as a form of popular defiance. "We've seen from the outset that the population is behind us and, more than ever, people want to be able to exercise their right to freedom of expression, freedom of association and the right to take part in peaceful demonstrations," Dejsardins said. "This is a new step in the fight against tuition hikes."